Help to get this this amazing album released! When the album is released you'll be able buy a hillarious CD about our wacky furry children and help save precious kitty lives too. The Cat Songs CD will bring abundant joy to the heart of any cat lover! 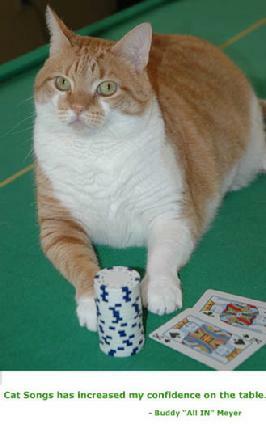 Buddy "all in" Meyer (the maverick Tabby pictued on the right) guarantees it! Plus 10% of our profits will benefit no-kill animal shelters! Listen to Cat Songs and watch the low budget videos!